Located in Durban, Olive Room Bed and Breakfast is a 4-minute drive from Phansi Museum and 7 minutes from University of KwaZulu-Natal. Free self parking is available onsite. When you stay at Lukafrica Riverside Chalets & Safaris in Letsitele, you'll be on a river and 12 minutes by car from Ndzalama Wildlife Reserve. Free self parking is available onsite. With a stay at Purple Trumpet Guesthouse in Pretoria, you'll be within a 15-minute drive of UNISA and Pretoria Country Club. Free self parking is available onsite. 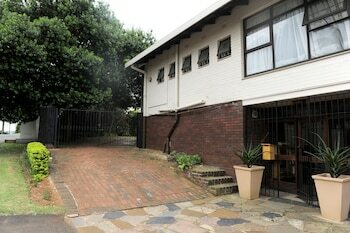 Located in Cape Town, Sunset Lodge Guest House is within a 15-minute walk of Sunset Beach and Dolphin Beach. Free self parking is available onsite. Located in Sabie, Ligna Lodge is within a 10-minute drive of Komatiland Forestry Museum and Sabie Falls. The front desk is staffed during limited hours. Free self parking is available onsite.